Sometimes allotmenteering isn’t all that fun. I am so behind on the bed prep. And Nature is choosing to go for things I really like. A lot of my beautiful pear tree’s leaves are covered in bright pink blisters, which the internet tells me is pear blister mite and, short of giving it a drastic haircut, there’s nothing I can do. I am unfeasibly attached to that tree. It was a mammoth drive to Brogdale to get it, it’s stood patiently waiting for somewhere to live for 9 months, and I feel a bit like I’ve let it down. 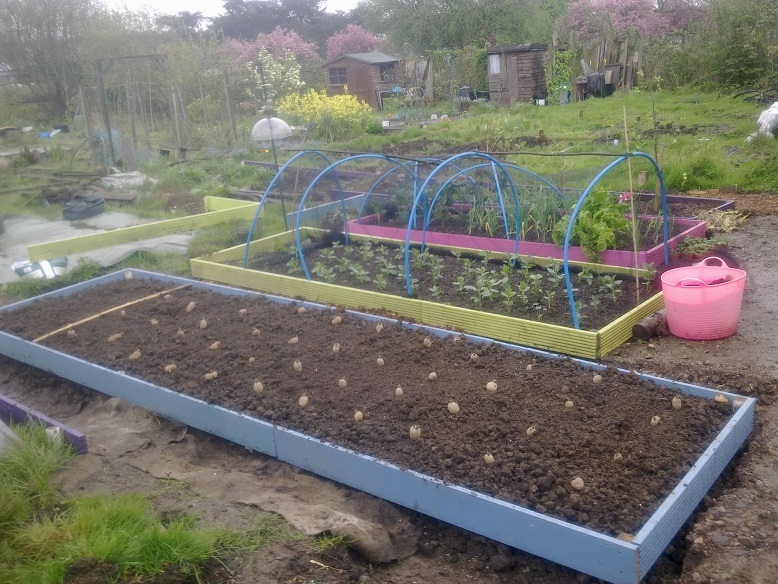 Zipped up to the plot after work, 1 hour later all 40 spuds are in the ground in a grid. 2 short rows Pentland Javelin, 4 rows each of Lady Christl and Charlotte and 1 of Desiree, from path to middle of plot. 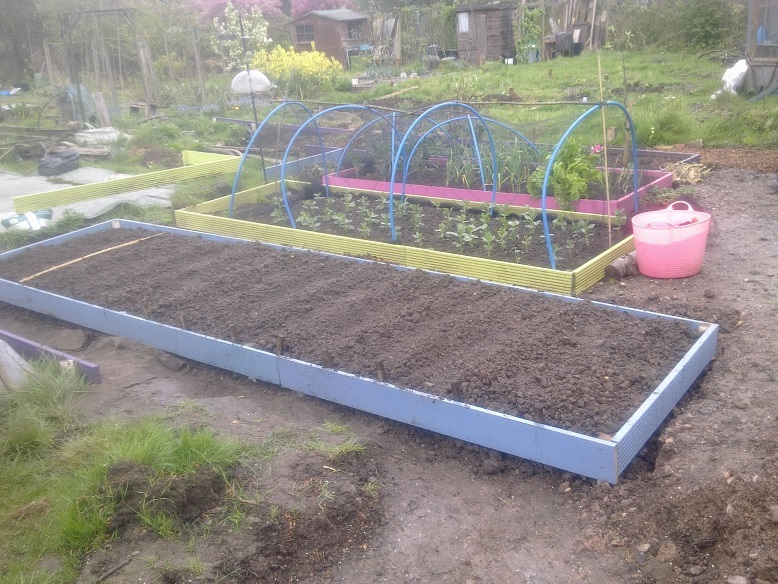 They are possibly a bit too close together – realised after the fact that last year’s spud bed was 40cm wider than this one, but I’ve planted the same number per row. D’oh. Still, they are in 2 weeks earlier than last year, and touch wood, there will be new spuds ready at the beginning of July. I don’t mind if some of them are small. I kicked about in the new woodchip delivery up at the site for a bit (it’s like piles of leaves, I can’t resist it) and went to Wickes to get more decking while it’s on offer. I need another 8 boards on top of the ones I have and that should be enough to get the plot done. I am always thankful the roof comes off my little car at moments like these. Just need to figure out how to paint them when the garage is full of car and we have guests from Friday. Last night I sowed Genovese courgettes for the seed circle and some tomatillos. Plus brussel sprouts (12), sugar snap peas (60), celery (sprinkling of dust masquerading as seeds), and tomatoes: Maskotka (5), Green Zebra (3), Black Cherry (3), Black Sea Man (5). I have large clumps of leeklings pushing their way through on the windowsill – looking at them there’s no way my leek sowing can be described as ‘even’ broadcasting! I’ve had a disaster with leeks 2 years running, so this is their last chance. Tonight I’ll be soaking some sweetcorn ready for chitting in the morning. Next up for crossing off the sowing list are parsnips, root parsley and a resowing of radishes. The jackdaws finished the first lot off but haven’t yet gone for other seedlings on the balcony, bar the odd leekling. I’ve bought some nice flowers for 2 of the planters, which I hope will cheer up my neighbour and encourage her to sit out there if she can manage the step – she’s in her 90s and getting very frail.